Opinion: A Very Winning Play? In his essay this week, NPR's Scott Simon wonders whether the most remarkable play of this college football season so far was really a win for the athletes. North Texas Mean Green wide receiver Keegan Brewer returns a punt for a touchdown on a fake fair catch. The most remarkable play of this college football season may have already occurred. 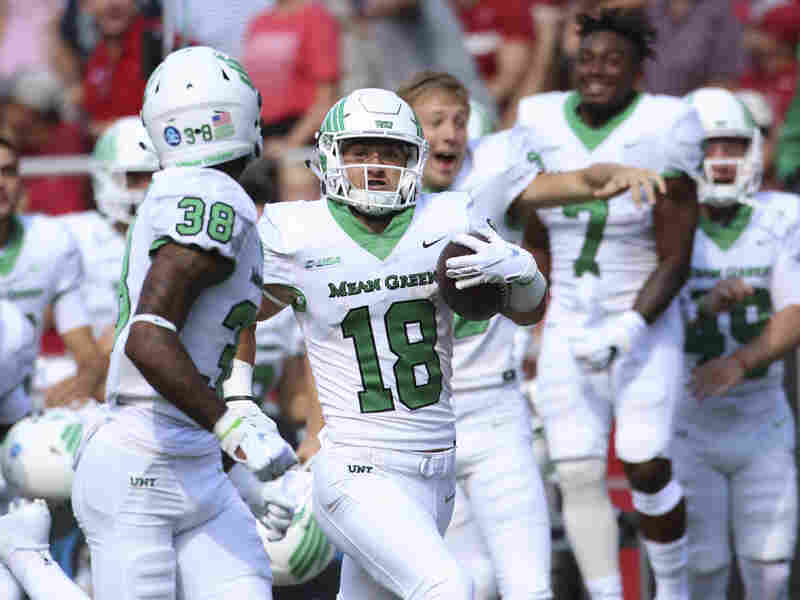 Last Saturday, in the first quarter of the game between the North Texas Mean Green and the Arkansas Razorbacks, Keegan Brewer, a wide receiver for North Texas, drifted back to catch a kick on the 10-yard line. He was surrounded by Razorbacks. Keegan Brewer caught the ball and stayed in place, as players do after they signal for what's called a fair catch. That's a rule by which they can catch the ball and not be hit — can't even be touched — and the play is whistled dead. Keegan Brewer stood in place, the ball locked in his arms, looking almost ... serene. His Mean Green teammates began to drift toward the sidelines. So the Arizona Razorbacks deployed around him began to drift away, too. Keegan Brewer later told reporters that one Razorback actually asked him, "Why aren't they blowing the whistle?" Because it was a Mean Green trick. Keegan Brewer had not signaled for a fair catch. When he saw Razorbacks begin to walk away, he took three casual steps, as if he was just headed to the sidelines for iced tea — then bolted downfield like a leopard, to score a 90-yard touchdown. North Texas went on to win, 44 to 17. The players and coaches of North Texas have accepted plaudits for their Emmy-caliber performances all week. Their fair catch trick was utterly within the rules. But what did it really achieve? The fair-catch rule isn't there to make the game more entertaining or competitive. It's meant to keep 11 players, running full-steam down the field, from smashing into one player who is looking skyward to catch a punt. The fair catch is meant to try to protect, as much as any rule in football really can, the skulls, brains and spines of young players, in a time when we know much more about the damage caused by football, especially brain injuries. I understand that North Texas coaches are proud of how deftly their players executed their trick. But the players are young, ambitious athletes who will do just about anything to please their coaches and prove themselves. If Arkansas had seen through North Texas's trick, redshirt sophomore Keegan Brewer, not his coaches, would have been isolated and defenseless on the field, even more vulnerable to head-ringing tackles that the fair-catch rule is meant to prevent. North Texas won the game by 27 points — and a lot of attention with their trick. But what did the coaches really win for their players?